From 'Superman' to 'Star Wars,' they're all here. One of the biggest elements behind the vast universe of No Man’s Sky is the thrill of exploration; the idea of discovering hundreds of planets for the first time and, then, working to catalogue everything they have to offer in your database. During your travels you’ll find hostile environments, beautiful landscapes and barren wastelands — but regardless of the discovery, you’ll be able to leave your mark on everything you find. Known for its appearance in Star Wars: Episode III – Revenge of the Sith, Mustafar is the small volcanic planet where Obi-Wan Kenobi and Anakin Skywalker duked it out in one of the best lightsaber battles from the Star Wars prequels. In No Man’s Sky, it may have a slightly difference coloration and significantly less lava, but it doesn’t make the radiation any less dangerous than an angry Darth Vader. An ancient and ethereal being dating back to the creation of the universe, Primus is a known as both a living planet and a god within the Transformers universe. Before the dawn of time, Primus ended up fighting his brother, Unicron, and created the mechanical world of Cybertron, where all Transformers originated from. Unfortunately, No Man’s Sky doesn’t seem to support gigantic robot battles though — so we’ll have to settle for this desolate landscape with oddly beautiful looking trees. Present in the original Mass Effect, Virmire is a lush world filled with oceans and tropical terrains. Here, players first encountered the Reaper known as Sovereign, who was working with Saren to bring about the next coming of the Reapers. In No Man’s Sky, we’ve yet to find either of them though — although the planet does seem to have plenty of aluminum for our trading routes. Named after the terraforming device in Star Trek II: The Wraith of Khan, Genesis is a planet that formed following the explosion of the Genesis Device. The planet was immediately declared off-limits by Starfleet and remained a galactic controversy for quite some time — but you can explore it in the work of No Man’s Sky, provided you can survival the toxicity of the atmosphere. This ancient planet is home to a special industry in The Hitchhiker’s Guide to the Galaxy: custom-made, luxury planet-building. Engineers pull matter through holes in space to form dream planets for rich, paying clients up until they bled the galaxy around them dry. In No Man’s Sky however, the planet is a hostile, barren environment filled with underwater caverns and giant mushroom-like plant life. Widely known as the home of DC’s own Superman, Supergirl, Kryto the Superdog and Power Girl; the planet was destroyed due to an explosion that was caused by the core, leaving the entire population dead with a few exceptions. 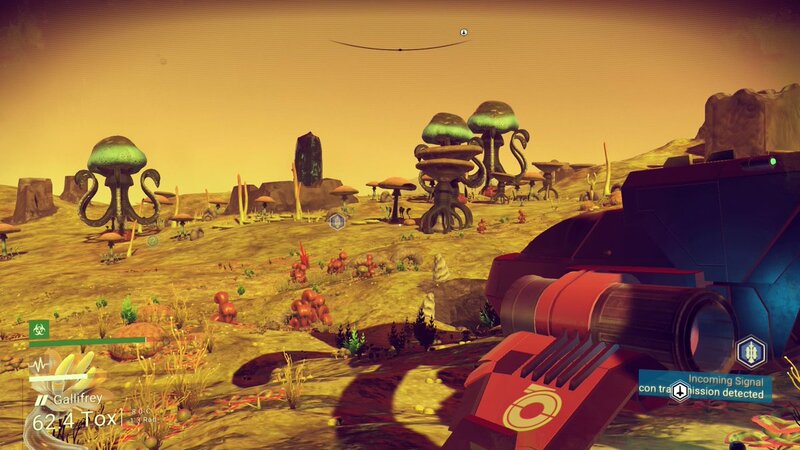 In No Man’s Sky Krypton is a barren planet covered with mushrooms, although it does offer a few rare resources for players. Home of the many Doctor’s present in Doctor Who, Gallifrey is a planet housing the Citadel of the Time Lords. The planet also had a barrier known as the quantum force field surrounding it alongside a transduction barrier which protected it from all means of danger and technological attack. In No Man’s Sky, Gallifrey is just a humble starting planet covered in all sizes of mushroom — but, who knows, maybe a few time lords are hidden within. Originally showing up in FuturamaSseason 3, Amazonia is a planet home to the Amazonian women and the illustrious Femputer. Men are advised to stay away from the planet so that they can avoid death by Snu-Snu. Much like it’s counterpart in Futurama, Amazonia in No Man’s Sky is a planet covered in lush jungles, giant lakes, and plenty of smaller Korvak settlements.